These Shelf Signs Use a Shovel Base to Easily Fit on Different Fixtures! These retail holders, shelf signs have different colours of plastic frame to choose from in order to fit in with different decors easily. The colours include red, blue, and black versions, allowing you to pick an eye-catching display that will fit in perfectly with your location. The inexpensive cost makes purchasing multiple units easy to maintain a uniform look! Shelf signs hold an A4 (297 x 210mm) graphic in either portrait or landscape orientation. 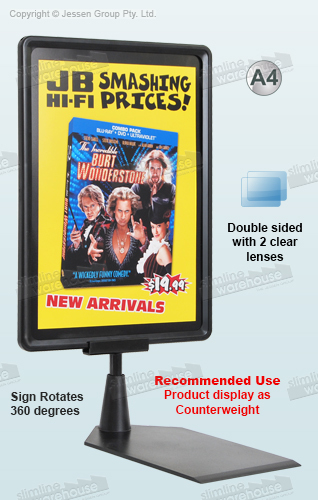 This display makes marketing to customers easy, as price tags, product information, and sale dates can all be placed within this sign to easily be seen by patrons. 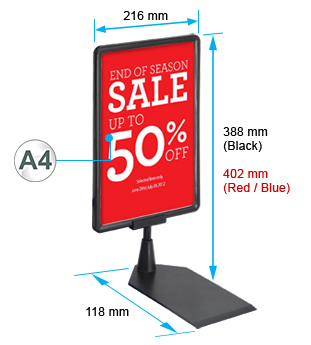 The dual-sided display makes promotion in two directions at once easy without taking up additional space. Pricing displays have a slide-in design that requires no tools for switching out graphics. Poster changes take less than one minute with this easy design! Clear lenses are included with your purchase to prevent dust and grime from gathering on your posters, maintaining a professional appearance in any location. 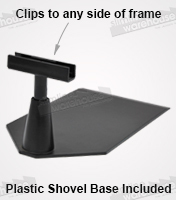 A shovel base is included that allows for 360° rotation to position your signage exactly as you want. 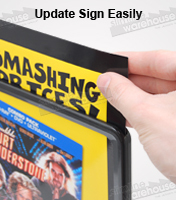 We recommend counter-weighting the display with a product to ensure it stays secure. This display is an easy purchase for many locations, where the eye-catching design will help get messages to customers. Retail display holders are available in many different sizes and colours to better fit your business. We have many supplies in stock now for outfitting your business in order to be set apart from the competition! Click here to see our entire range of products. We are adding new products weekly, helping our customers to stay with the latest trends & technologies! Slimline Warehouse has been providing Australians with high-quality products at low prices for over 20 years. Our warehouse provides same day despatch on most in stock products if purchased by 1pm EST! Order today for shipment to anywhere in Australia, including Sydney, Melbourne, Canberra, Brisbane, Cairns, Adelaide, Perth, Toowoomba, & Alice Springs! All our POP displays are manufactured to the highest material and quality standards and we back the quality of these affordable items with a 7 day money back guarantee.